All our boxes are made from top grade planed, tongued and grooved quality timber throughout including roof (not shiplap). Not only is this much stronger and more durable, it also gives a much better insulation. 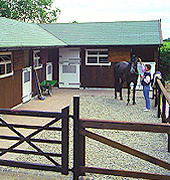 All our loose boxes include a 915mm (3’) plus canopy, except our pony boxes. The roof is constructed of planed, tongued and grooved boards. This roof coupled with our ventilation system will give added protection against condensation. Other types and colours of felt, Onduline or felt tiles are available if required. We offer free delivery and assembly to most areas on our loose boxes, field shelters, american barns and implement stores. Our units are extendible at any time; and should you change your address we would be pleased to dismantle and re-erect at your new home. All buildings are sectional and bolted together, including the roof. We manufacture extremely strong and long lasting boxes at a very competitive price. Our Works cover six acres and are supervised exclusively by the Hodgson family who have been building timber buildings for over 100 years! this knowlege and experience will enable you, the customer, to obtain a real value for money quality product. Visitors to our extensive display centre are most welcome.